There's just something about London with its beautiful, regal buildings that make you feel like you've stepped into another time. And in my past journeys to London, I've never stayed in a place that felt as nostalgic as Astor Hyde Park Hostel. Nestled down a street, right near the famous Hyde Park is this gorgeous accomodation that I came to call home for five nights. Right as you approach it from the outside, you're greeted by a lovely facade that feels almost like walking into an old school dwelling. And I definitely felt like I was staying in an English boarding school as I walked inside the entrance hall. I was greeted sweetly by the front desk guy and walked up the stairs to my room. The hostel just felt homey and like I was in a place I could feel comfortable in for my stay without the worries that come along with places I've stayed in the past. I got into my room and there was a huge locker under the bed to store my belongings, which I was happy to see because I was not exactly traveling light and it could fit my suitcase and all my other stuff I'd been hauling around with me for the past week and a half. While in my past life I was someone who liked to go out late during my travels, I've since lost that youthful quality and truly just enjoy spending an hour or so in bed before going to sleep to catch up on work or social media. Thankfully the bed was so comfortable and the blanket was literally the best I've ever experienced in a hostel before. And it wasn't cramped either. Even though there were six beds, there was so much floor space and felt like a place I didn't have to feel so confined in as I used the actually very reliable wi-fi and before falling asleep. I truly liked the vibe of the hostel and how it felt like a place travelers could hang out, but also there didn't feel like forced interactions were made so I could easily say hi and speak to someone else in my room or in the breakfast hall, but there was no one badgering me to join a pub crawl and trying to make me feel guilty for my relaxed trip I was trying to go for. 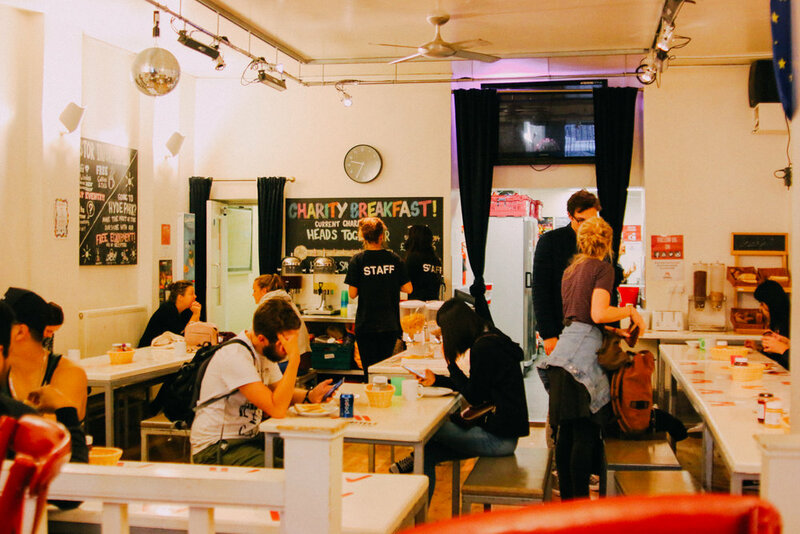 Each morning, I would head down to the breakfast room and deposit the £1 donation for the meal in their pail (with all proceeds going to the victims of the Grenfell Tower fire) and sit down and enjoy the funky room with a dining hall feel that I was missing from college. There was a huge wall you could sign and leave your mark upon London. What I really loved was the hostel was literally right around the corner from my favorite London museum, the Victoria and Albert. This design museum covers historical art from all time periods and is just a wonderful place to wander around for a few hours. I hadn't been in ages when I went, so it was great to go back and see the giant rooms full of artwork and archeological items. The hostel is also right near the Natural History Museum and Science Museum as well, and the area is easily accessible by buses and the Tube. They also have a great kitchen if you want to cook your own meals, and lots of fridge space as well as discounts at local eateries with a coupon they give you upon checking in. It's definitely one of the nicest hostels I've ever stayed at. 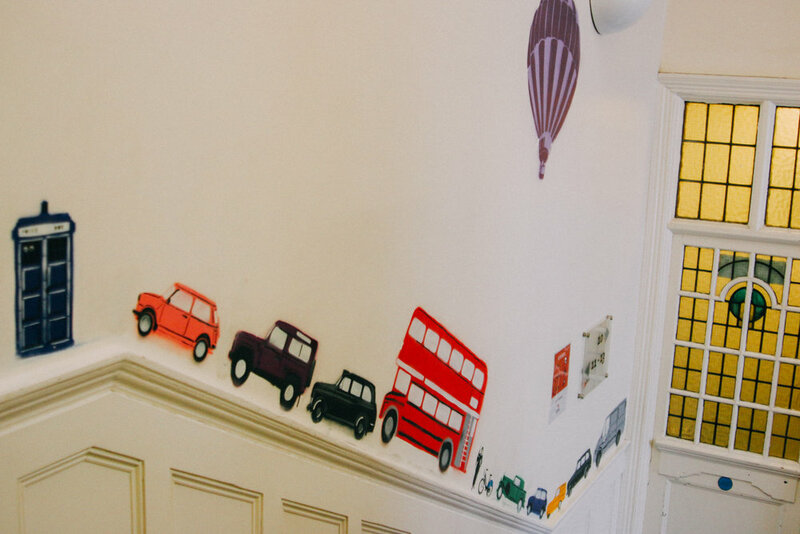 The prices are extremely inexpensive with rooms starting at £16 per night for a nice, comfy bed and you can book directly through their site (use the code ASTORLUV for 10% off). Astor Hostels also have three other locations if you need to be closer to a different area of the city, but this one is perfectly placed and I wholeheartedly suggest it for a lovely London stay. Disclaimer: I was a guest of Astor Hyde Park Hostel. All opinions are my own.